Do you like writing? Do you like news? Do you like writing the news? 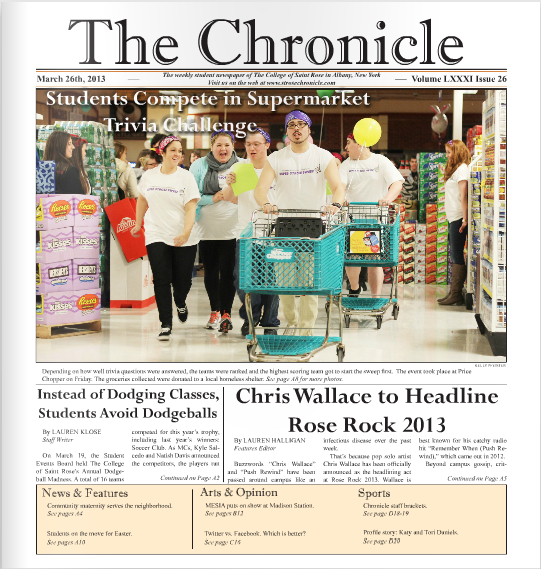 This time, I’ve got Chris Suprenant, Arts Editor for the student-made newspaper on campus, The Chronicle! A: The Chronicle seeks to inform its readers about news happening around campus, as well as provide content relevant to student life. In our News section, we include stories about students and faculty on campus, events that come to the school, things that have a direct impact on the lives of students, as well as what is going on the Pine Hills neighborhood. The Arts section provides reviews of television shows, movies, and new music, as well as books and restaurants, anything relevant to student interests. The Opinion section provides differing views on issues that relate to our school as well as our readers. That includes politics, campus events, world news, anything that anyone has to say. Our Sports section covers the college’s sports teams, includes profiles of our athletes, as well as commentary on professional sports. A: Including all of our editors and staff writers, we probably have about 30 people on our staff. 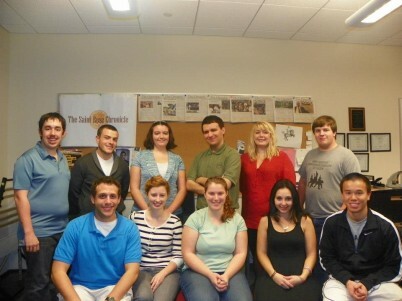 Our staff writers are usually focused in one section, be it News, Arts, Opinion, or Sports. A: Our general/staff meetings take place every Wednesday in the Hearst Center for Communications and Interactive Media in Room 121 at 4:30 pm. At 4:00 there is a meeting for editors to discuss the content for the upcoming edition. A: Absolutely anyone can attend our meetings! We welcome students from all majors. Typically we have Communications students interested, as well as English majors because of their focus on writing. However, anyone who has an opinion to express, a movie to review, a sport to comment on, or a news story to write, we want to hear about it. Our campus is so diverse, and we would love to reflect that in our publication. A: We do collaborate with other clubs from time to time. We try to highlight some of the clubs on campus by running stories about them to get the information out to the student body. Depending on the week, the Opinion section will run pieces from various clubs such as Identity, Environmental Club, and United Mathematics Organization. A: In years past, we’ve held a wiffle ball tournament, a charity Christmas party benefit the Marillac Family Shelter, co-sponsored a literacy event with the Capital District Association for Educating Young Children, and participated in an Around the World event with several other clubs through BASIC. The charity Christmas party of 2011 holds a special place in my heart. We setup a “Pie An Editor” station that went over well with all who attended. I have never seen so much Redi Whip in my entire life! Everyone who participated had a really great time, especially knowing that we were raising money for a good cause. Q: What events/activities do you have planned for later this semester or next semester? A: We haven’t gotten that far yet, but we’ll hopefully [be] doing some fundraisers towards the end of the semester. A: Not at all. The club is 100% free to join. A: To anyone thinking about joining The Chronicle, know that it’s full of great people who love what they do. We love to have fun while doing our campus an important service. Anyone who likes to write, we want you! Anyone who loves to take photos, we want you! There’s pretty much a place for everyone on our staff. Q: What do you and your members think the slogan/catch-phrase of your club is? A: We don’t really have a slogan at this time, but it’s definitely something we’re working on. Q: Can someone not in the group submit to the paper? A: Yes, anyone can submit to the paper. Once someone submits three articles, they are given the title of “Staff Writer.” Up until that point, their names will have “Contributing Writer” attached to them in the byline. Writers do not necessarily need to submit work on a weekly basis, either. While everyone is certainly encouraged to, there’s no set rule about how often anyone has to write.